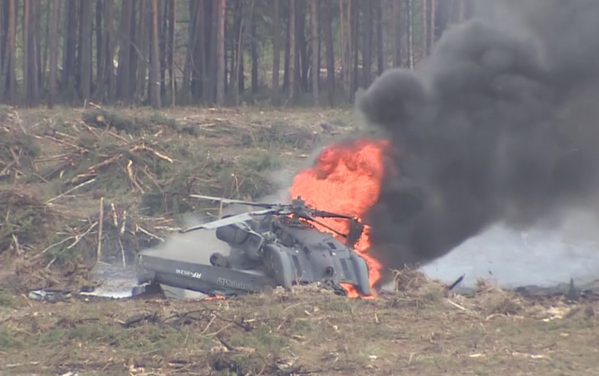 The helicopter crashed during a demonstration flight at an airshow in Russia's Ryazan region. One pilot died in a Mil Mi-28N attack helicopter (NATO reporting name Havoc) crash while performing a demonstration flight at an airshow in Russia, the Defense Ministry confirmed Sunday. "The ‘Berkut' aerobatics crew Mi-28 helicopter crashed today while performing demonstration flights at the Dubrovichy range in Ryazan Region," the ministry's press office confirmed. The sources initially told RIA Novosti both of the pilots had catapulted from the all-weather anti-armor attack helicopter in Ryazan Region, around 110 miles south of Moscow. They later elaborated that one of the pilots had died and the helicopter was completely obliterated.